Merry Christmas Eve! 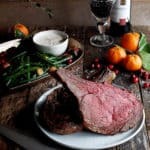 I’ll be serving this Salt Crusted Beef Rib Roast with Horseradish Sauce tonight, and I think everyone will love it! This beef rib roast is absolutely amazing. The magic is in the salt mixture that gets rubbed (or packed) on top of the roast. It’s just 3 simple ingredients – salt, garlic powder, and freshly cracked black pepper. But, something about that combination when roasted onto the meat turns out so wonderful (you can thank my dad…it’s the rub he puts on almost anything when roasting!). The salt and spices almost “melt” into the meat and then crisp up to form a really beautiful crust. It makes for such a flavorful roast. And my favorite sauce for serving with beef? Horseradish sauce! I think this is a combination that everyone loves. 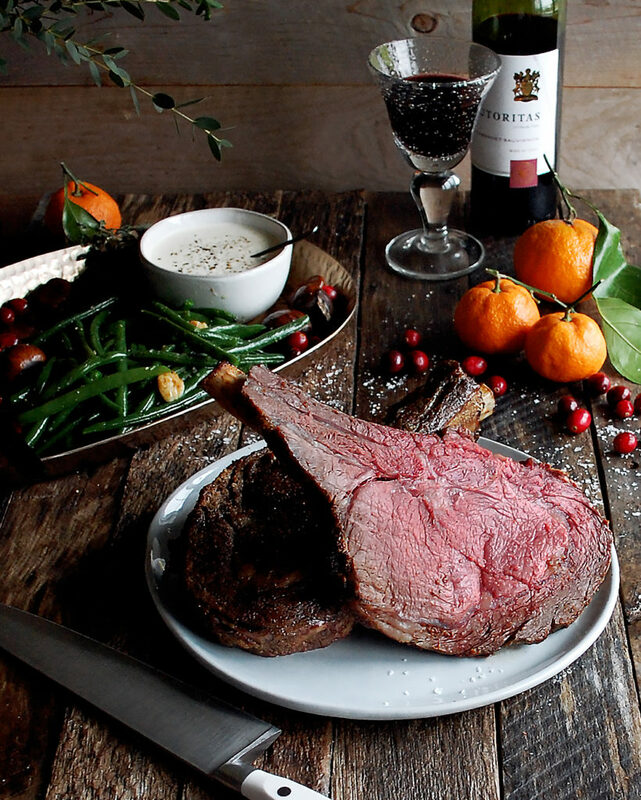 The tangy, creamy sauce pairs perfectly with the rich, fatty beef rib roast. I made some quick green beans to serve on the side, and I also think this mac & cheese would be the perfect addition to complete the meal! I hope you enjoy. I have a few more recipes to get posted before Christmas, so stay tuned! Preheat the oven to 450°F. Prepare a roasting pan with a wire rack. Place the rib roast on the rack, ribs facing down, and pat dry with paper towels. In a small bowl, mix together the salt, garlic powder, and black pepper. Pack the mixture onto the rib roast, evenly distributing it across the entire roast. Roast the meat for 25 minutes. Lower the heat to 275°F. Continue to roast the meat for about 1 hour and 15 minutes, or until cooked to your desired temperature. Remove the pan from the oven. Loosely tent the meat with foil and let rest for 20 minutes. Slice the rib roast right before serving. Combine the sour cream, mayonnaise, mustard, horseradish, and lemon juice in a mixing bowl. Whisk until fully incorporated. Add the salt and taste the sauce. Leave as is or add more salt if you like. Keep cold until serving. Bring a large pot of water to a boil. Add a heaping pinch of salt. Add the green beans, working in batches if needed, and blanch for about 5 minutes. Transfer the green beans to an ice bath (a large bowl of ice water). Let chill in the ice bath for 1 minute. Transfer the green beans to paper towels in order to dry fully. Right before serving, heat a large sauté pan over medium-high heat. Add a generous amount of olive oil to coat the bottom of the pan. When the oil is hot, add the garlic. Cook for 20 seconds (be careful, it will burn). Immediately add the green beans and let sauté in the garlic oil for about 4-5 minutes. Season with salt and freshly cracked black pepper. Serve warm. 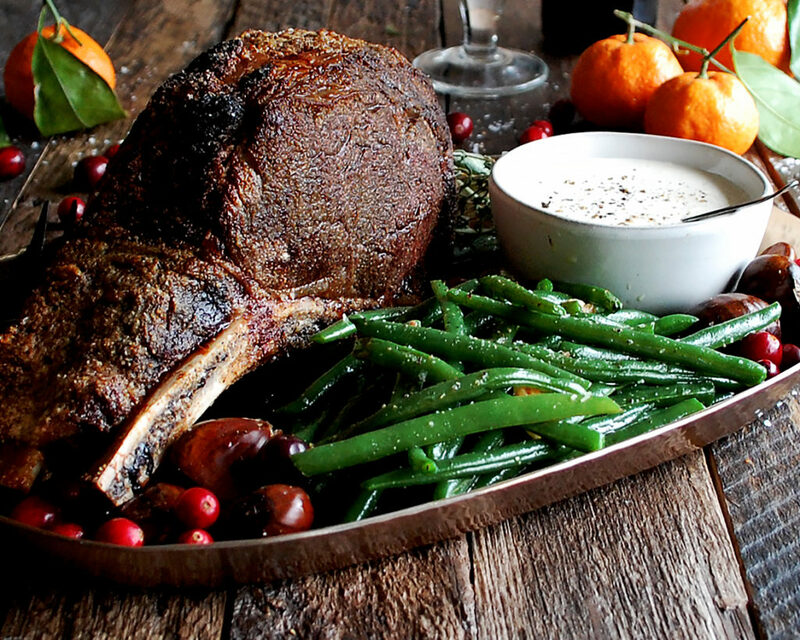 Serve the roast with the horseradish sauce and green beans on the side.